The Scanning for Emerging Science and Technology Issues (SESTI) project was about identifying “emerging issues” that could have a potentially significant impact on society by 2030, are still not sufficiently recognised by policy makers, and to which policy makers should (perhaps) pay more attention. The overall objectives were to research the added value of weak signal scanning, develop and improve the theoretical concept of weak signals, assess the strengths and weaknesses of several scanning methods (exploratory and evaluative), identify emerging issues and ways of creating awareness among the policy community. Often societal developments are highly influenced by unlikely events with low probability but high impact. These so-called “weak signals” are not clear-cut and are only rarely discussed in the policy arena (or not at all). Although it is generally accepted that early warning to these weak signals is an important input to policy making, the development of approaches and methods to identify them and feed them into the policy process are still in the early stages. Apart from more traditional approaches, which are still useful in dealing with these “weak signals”, the developments in ICT offer new opportunities for efficient and effective identification methods. An essential characteristic of “weak signals” is the combination of low probability and high potential impact. Normally these “weak signals” are not discussed in mainstream policy settings, let alone addressed by policy. However, they need to be anticipated to ensure quick and adequate responses to benefit from opportunities given and/or counteract undesired impact. On the one hand, an accelerating pace of scientific discoveries opens up new opportunities for developing innovative new products and services. The early detection of “weak signals” in scientific areas with potentially large impact on innovation is one crucial element of the project effort. On the other hand, Europe is likely to be confronted in the future with new sets of socio-economic challenges. Several of these challenges are already under discussion today while others remain vague and uncertain. In this respect, there is equally a need to look ahead and identify possible future trends and socio-economic challenges with a high impact. The Scanning for Emerging Science and Technology Issues (SESTI) project aimed at combining research in the field of “weak signals” in order to determine and assess what approaches and methods can be used for policy purposes and to identify the future of research in case studies and show how the results of research can be made usable for policy. The SESTI project was mainly financed by the European Union in the Seventh Framework Programme under the Social Sciences and Humanities theme. The consortium involved in the collaborative effort consisted of the following parties: the Austrian Institute of Technology, the Institute for Prospective Technological Studies, the Malta Council for Science and Technology, the Manchester Institute of Innovation Research, and the Dutch TNO Strategies for the Information Society group. The overall goal of the project was to contribute to the development of an effective transnational system for the early identification of weak signals of emerging issues that will have an impact on Europe. In the project, two research questions were central: (1) What new foresight approaches can be used to identify “weak signals” in a systematic, efficient and effective way, and how can they be made operational? (2) How can “weak signals” be systematically linked to policy processes to have an impact? Another objective of the study was to evaluate the answers to the research questions stated above in a practical situation to enhance usability. For this purpose, the case of the future of research was chosen, leading to the following research questions: (1) What are the weak signals at the interface between scientific discovery, emerging fields of innovation and societal needs in Europe? (2) What national and global developments in business, research and society have a high potential impact on the research infrastructure, and what will happen if they are not addressed by policy? Topics that are not currently addressed by EU policy or FP7 or are addressed in a limited way. Topics with a long-term orientation (2030) and having no “owner” in the European Policy arena. Topics that have relative low probability and potentially high impact. The overall strategy of the project was to balance content development, methodological insights in “weak signal” identification and actual use of information by the user (policy) community, which again may lead to new insights for the operationalisation of methods. In the following text, the different aspects of the project shown in the diagram will be discussed summarily. One of the cornerstones of the project was the WikiHub. This Internet website provided the backbone to the communication infrastructure, both internally and externally. 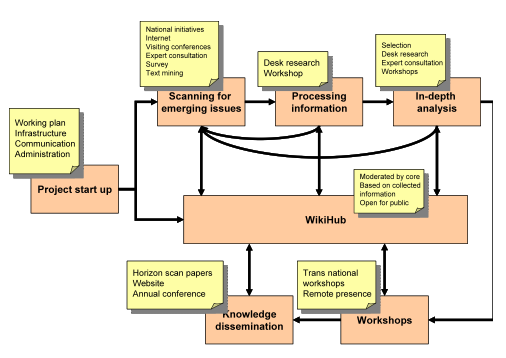 The WikiHub fulfilled two functions: it served as a communication and a scanning tool. The information collected would be integrated into the WikiHub acting as a pool of weak signals that could be edited by the different partners responsible for the various scanning activities as well as by external users. The objective of this work package was to scan the environment for weak signals and emerging issues. An important base for this would be the joint database of the coordination group of national horizon scanning, which was initiated by the Forsociety ERA Net. The methods used included input from national foresight representatives and initiatives, Internet scans, literature scans, participatory conferences, electronic surveys and interviews with visionaries. 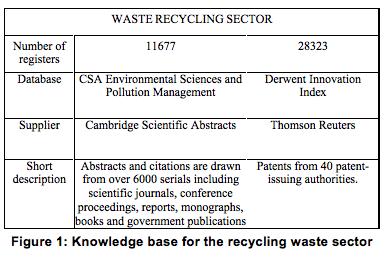 The objective of this work package was to process the information collected in the scanning activities. As this was still fragmented information stemming from different sources, it needed to be processed to achieve a coherent structure. The information collected was processed in a first stage by one of the project partners for discussion at workshops. During two workshops general futures experts were involved. They selected 50 emerging issues for further analysis based on an input document containing a long list of issues describing them from a global perspective. The major objective of this work package was to research in depth selected emerging issues creating more background information to initiate a discussion in the policy arena. The selected issues were further investigated using desk research, interviews and an internal expert workshop oriented towards creating new (contextual) information. For each issue, a horizon scan discussion document was drawn up, describing in depth the respective issue, to serve as a basis for the discussions at the transnational (and potential national) workshops. The results of the in-depth analysis of the emerging issues selected were presented to international stakeholders to evaluate the potential impact and create momentum to address and elaborate the issue. These results, together with the horizon scan discussion document, were presented at an EU-level workshop that was organised for EU representatives from different areas and also involved experts in the field to discuss the issue. An advisory commission played a large role in the selection of the signals to be further assessed. All signals identified would be assessed with a semi-quantitative indicator scheme to be developed during the start up phase. This work package aimed at facilitating the effective dissemination of knowledge generated through the project and sought to ensure that strategic intelligence and information would reach relevant stakeholders, in particular policy-makers and those responsible for implementing policies. At the end of the project, a two-day conference was held to present, discuss and assess the results of the project as well as enhance the functioning of the network. The weak signals and emerging issues that were identified in the SESTI project were divided into three categories: health, energy and cognitive enhancement. The final SESTI conference discussed all three categories2. In the following, we describe each of these categories in turn and show policy implications. An ageing society, longer life expectancy, advances in medical technologies and new medicines are leading to spiralling costs and putting unprecedented pressures on the provision of healthcare services throughout Europe. Using the techniques developed earlier in the project, the SESTI team identified a number of emerging issues of which the five listed below were selected for discussion during a workshop held in Brussels in November 2010. The workshop was attended by thematic experts as well as national and EC policy-makers. Diversification in medicine. A wide range of new offerings beyond conventional medicine and outside the public health system has sprung up in recent years. Emerging technologies may lead to new approaches, alternative methods are gaining more attention, and new health related service markets are emerging. Mental health in an ageing society. Advances in medicine mean that humans are living longer than ever before. However, the quality of life of the elderly is often compromised due to frailty, reduced mobility, dependence on medication, financial limitations and loneliness in the twilight years. Obesity: The global epidemic marches on. It is estimated that in excess of one billion adults are overweight, at least 300 million of whom are clinically obese. Obesity has reached epidemic proportions and is a major contributor to the global burden of chronic disease and disability. Is prevention better than cure? Re-prioritising health research. It is a fact that a number of simple preventive measures, such as consumption of nutritious foods, better personal hygiene and sanitation, both when handling food and during medical treatment, have contributed significantly to improved levels of health. Personalised treatment. The response of an individual to a medicinal drug may depend on a number of factors, such as gender, age and the genetic makeup of that individual. Personalised medicine is a health care approach that tailors interventions to individual genetic variation in risk and treatment response. The development of secure, cost-effective and environmentally friendly sources of energy has become one of the greatest and most pressing challenges facing humankind. The SESTI team again applied the techniques developed in the course of the project to identify emerging issues in the field of energy. The following five were selected for discussion during the Brussels workshop with experts and policymakers in November 2010. Hybrid nuclear energy. Energy from nuclear fission reactors remains a controversial topic. Nuclear fusion promises a virtually limitless supply of clean energy without the problem of hazardous by-products but remains stubbornly a promise in the future. Recent developments in the form of hybrid fission and fusion reactors might reduce the timeframe within which nuclear plants could become a viable source of clean energy. Renewable energy from the desert. Large-scale generation of electricity from solar energy requires a large land area coupled with long hours of high-intensity sunlight. The deserts of the MENA (Middle East and North Africa) countries fit this requirement admirably. Large concentrated plants could generate electricity that could then be transported to European countries using high-voltage DC cables. A small percentage of the total desert area would be sufficient to provide energy for the whole of Europe. Biofuels, biomass and biomimicry. The production of ethanol and other biofuels from crops has already become an important source of renewable energy in the transport sector. However, current yield in terms of quantity of fuel per unit of land area is still too low to make this a viable option for large-scale energy generation. Crop-based biofuels compete with food crops for arable land and can affect the availability and price of grain. Genetic engineering offers the possibility of achieving significant improvements in yield, which calls for further research in this area. Unknown risks of the hydrogen economy: A recent initiative to combat global warming involves the use of solar energy to generate hydrogen, which may then be used to drive fuel cells to generate electricity in electric cars. One possible risk relates to the leakage of hydrogen into the atmosphere. Since hydrogen is lighter than air, any leaked hydrogen would probably rise through the atmosphere and reach the stratosphere. Here it can react with ozone, producing water vapour, which may increase the size and frequency of polar stratospheric clouds or increase the ozone hole. Since hydrogen is very scarce in the atmosphere, even relatively minor amounts of the gas may have a significant impact on the weather. Digging deeper and farther: Diminishing existing oil and gas reserves have extended exploration into more hostile and challenging environments. Despite proper precautions, accidents are bound to happen and advances in drilling technology appear to have outstripped the ability to plug a leaking oil well at extreme depth. Human enhancement is a field of growing interest in different communities. It is an umbrella term used to describe the expansion of physical or cognitive abilities of individuals. It can be temporary (e.g., using pharmaceuticals) or permanent (e.g., surgery, implants), and can be applied as a therapeutic measure (to correct a deficiency or impairment) or as an improvement. The term is also sometimes used to refer to measures aimed at increasing the life span of an individual. Cognitive enhancement is a form of human enhancement that may be defined as the amplification or extension of core capacities of the mind through improvement or augmentation of internal or external information processing systems. During a workshop held in Brussels in June 2010, a number of issues related to cognitive enhancement were identified that deserve special attention from policymakers. Among the issues discussed were the need for interdisciplinary research and political regulation. Interdisciplinary research: Many of the developments in cognitive enhancement are expected from interdisciplinary research. From the proponents’ point of view, the promotion of such research requires national and European research programmes specifically designed for this purpose. Regulatory needs: Many of the topics under development have profound ethical and legal implications and raise questions regarding the need for regulation or guidelines in areas not addressed by existing legislation, such as the use of products affecting the brain, the combination of living organs with technology, or privacy issues caused by ICT implants. Butter et al., 2010, Cognitive Enhancement Workshop: Weak Signals and Emerging Issues for European Policy, SESTI deliverable D 7.7 (1), obtained from SESTI website: http://sesti.info/workshops/. Butter et al., 2011, Scanning for early recognition of emerging issues; dealing with the unexpected. 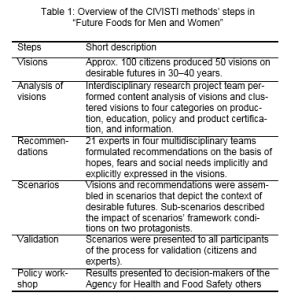 An operational framework for the identification and assessment of new future developments, SESTI deliverable D 6.2 (2), obtained from SESTI website: http://sesti.info/workshops/. Butter et al., 2010, Energy Workshop: Weak Signals and Emerging Issues for European Policy, SESTI deliverable D 7.7 (3), obtained from SESTI website: http://sesti.info/workshops/. Butter et al., 2010, Health Workshop: Weak Signals and Emerging Issues for European Policy, SESTI deliverable D 7.7 (4), obtained from SESTI website: http://sesti.info/workshops/. This paper focuses on an analysis of the Millennium Project’s “Futures Research Methodology – Version 3.0” report with the aim of making it more meaningful and useful particularly for foresight practitioners but also for users in general. The compilation of future methodologies is assessed in terms of the understanding of the nature of systems implied in the method and what it suggests as the best means of influencing systems. The analysis aims at improving our understand-ing of the wide range of knowledge, practices and assumptions these methods convey and enhancing our ability to learn about futures and expand our horizons of futures knowledge. The following analysis of the Millennium Project’s “Fu-tures Research Methodology – Version 3.0” starts from the claim that much of the sensitivity of an organisation derives from its members and their ability to flexibly apply different theories and methods. Practitioners need to pay more attention to theory and understand how the theory and the methods they use significantly influence the way they perceive their environment and the outcomes of strategic processes. Figure 1 describes the landscape in which foresight methods are used. The figure identifies four distinct types of landscapes, two of which – engineering ap-proaches and systems thinking – have a long history, find widespread use and currently dominate thinking and practice in strategic management. The other two – mathematical complexity and social complexity – are not yet widely used and represent both a contrasting and a complementary view of how the future emerges. Let me first clarify the differences in the basic assump-tions between these four approaches: The vertical di-mension looks at the nature of the possible ways of understanding systems and the horizontal one at the means of controlling or directing that system. In the vertical dimension, design is contrasted with emer-gence: engineering approaches and systems thinking represent design, and mathematical complexity and social complexity stand for more emergent processes. How sense-making is accomplished and what kinds of solutions are provided in moving across time and space is at the heart of the model of analysis. By design, we mean the ability of a manager, expert or researcher to stand outside the system and design the system as a whole. In case of emergent systems, the system cannot be understood or managed as a whole by a manager, expert and researcher, or by anyone at all for that matter, because the system emerges through the interac-tion of actors who act on the basis of local knowledge and their own principles. In the horizontal dimension, we contrast rules that reduce ambiguity with heuristics that provide direction while allowing for a degree of ambiguity that can adapt to different and changing contexts. There is a design element to emergent sys-tems but not in the same way as in the case of designed systems. That is to say, there are various ways to influence the evolution of emergent systems, but they can-not be deliberately controlled or directed by any single actor or group of actors. We can take the next step by placing the methods in the sense-making model (Figure 2 below). The model works as an effective communication tool capable of delivering a large amount of information about the methodology of Futures Research Methodology – Ver-sion 3.0, the properties of each method as well as the relationships between the methods. The analysis reveals that most of the methods pre-sented in Futures Research Methodology – Version 3.0 are designed to reduce ambiguity. They concentrate on knowing, or to be more precise, on providing more knowledge to a decision-making process. Most of the methods adopt a position outside the system in order to bring new information into the system. Other types of frequently used methods are those that seek to create an awareness of possible futures and what they con-vey. The embedded conception of causality, of how things happen, is that there is an actor capable of dis-covering the causalities and designing interventions that will lead to a desirable future. There are methods that explicitly or implicitly rely on different causal assumptions about how things happen. The methods placed in the upper half of the model share the belief that things happen through the (local) interaction of agents. The movement towards a future is seen to depend on the other actors, the adaptive moves of a single actor influencing other actors’ strate-gies by creating new possibilities and constraints. Comparing the number of methods found in the upper part of the model to the number in the lower section, this approach would seem to be less popular among futurists than its design counterpart. However, some methods are constructed with the aim of reducing am-biguity and simulating emergent options. 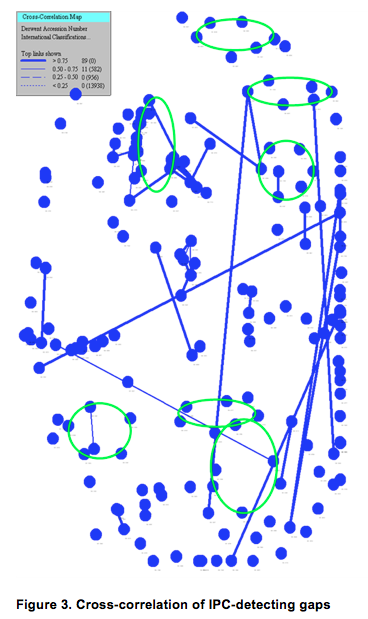 The smallest number of methods lies in the social complexity square indicating that there are few methods trying to provide direction in a not always orderly environment while allowing for some degree of ambiguity. We assume that the qualities of a method derive at least partly from assumptions about the basic nature of organisational life. The answers to these assumptions reveal three important properties of each method: how the method stands in respect to whether or how much managers are or should be in control, how ordered or chaotic the landscape where the actions take place is or will be, and finally what the means offered for shap-ing the future are. It is perhaps correct to claim that methods presented in the lower left-hand square of Figure 1 are or have be-come well known and that they are also relatively easy to use. In the upper left-hand square, the methods are much more sophisticated; they often require some mathematical background and programming skills. Despite their sophistication, there exist some serious doubts concerning their capability of offering anything other than engineering approaches. In the lower right-hand square, systems approaches handle ambiguity better than more design-orientated approaches and offer more stability than emergent approaches but only work well in conditions where there are a limited number of interactions and the system can be designed. Finally, in the upper right-hand square, social complexity is presented as a field of possibility not yet fully utilized. It has not been widely adopted because its main strength is limited to dealing with poorly understood emergent, nonlinear phenomena and providing explanations and an understanding of a system’s direction in the absence of control of that system. One more argument can be added to the ones pre-sented so far, namely that the business environment is becoming ever more complex. And one conclusion to be drawn from this should be that companies need to shift from ambiguity reducing strategies to ambiguity absorb-ing ones. All this calls for developing theoretical and methodological tools very different from those we use today. Such a shift would require incorporating emer-gence into our understanding of strategic processes and the possibility of a new kind of order arising from, or being found hidden within, complex phenomena, i.e. an order based on the tools and methods by which people make and unmake ordered and unordered worlds. Aaltonen, M. (2007) The Third Lens. Multi-ontology Sense-making and Strategic Decision-making. Ashgate Publishing Limited. Aldershot. Aaltonen, M. (2009) “Multi-Ontology, Sense-making and the Emergence of the Future”. Futures 41, 279-283. Aaltonen, M. (2010) Robustness – Anticipatory and Adaptive Human Systems. Emergent Publications. Litchfield Park, USA. Aaltonen, M. & Sanders, T.I. (2006) “Identifying Systems’ New Initial Conditions as Influence Points for Future”. Foresight. Vol. 8, No. 3, 28-35. Aaltonen, M. & Barth, T. (2005) “Making Sense of Future. 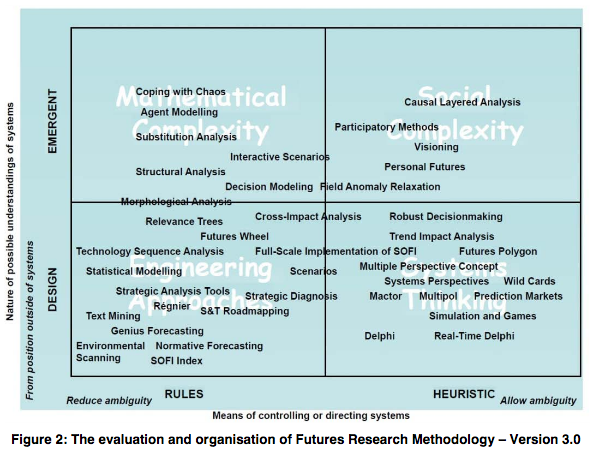 Analysis of Futures Research Methodology V2.0”. Journal of Futures Studies. May 2005, 9(4), 45-60. Aaltonen, M. (2005) Futures Research Methods as Boundary Objects. Futura 2-3/2005, 29-38. Arbnor, I. & Bjerke, B. (1997) Methodology for Creating Business Knowledge. Sage. London. Bogner, W. C. & Barr, P. S. (2000) “Making Sense in Hypercompetitive Environments: A Cognitive Explanation for the Persistence of High Velocity Competition”. Organization Science, Vol. 11, No. 2, March-April 2000, 212-226. Burrell, G. & Morgan, G. (1979) Sociological Paradigms and Organisational Analysis. Elements of the Sociology of Corporate Life. Ashgate. Aldershot. Christensen, C. & Raynor, M. (2003) “Why Hard-Nosed Executives Should Care Abut Management Theory”. Harvard Business Review, September 2003, 67-74. Dervin, B. & Foreman-Wernet, L. & Layterbach, E. (2002) Sense-Making Methodology. Reader. Hampton Press Inc. New Jersey. Glenn, Jerome C. & Gordon, Theodore J. (2009) Futures Research Methodology. CD-ROM. Version 3.0, Washington, DC: The Millenium Project. Mitleton-Kelly, E. (2003) Complex Systems and Evolutionary Perspectives on Organisations. 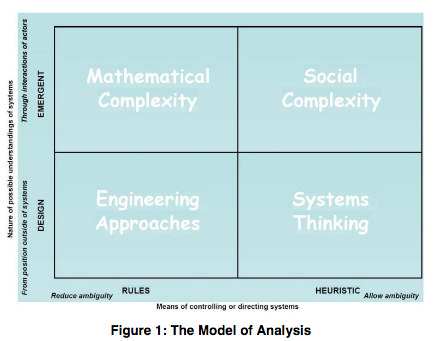 The Ap-plication of Complexity Theory to Organisations. Pergamon. Amsterdam. Sarr, R. A. & Fairhurst, G. T. (1996) The Art of Framing. Managing the Language of Leadership. Jossey-Bass. San Fransisco. Schmidt, K. & Wagner, I. (2005) “Ordering Systems: Coordinative Practices and Artifacts in Archtec-tural Design and Planning”. In: Computer Supported Cooperative Work. Shaw, P. (1997) “Intervening in the Shadow Systems of Organizations: Consulting from a Complexity Perspective.” Journal of Organizational Change Management 10 (3): 235-250. Snowden, D. (2004) “Innovation as an objective of knowledge management. Part I the landscape of management.” IBM Business Journal. Snowden, D. & Boone, M. E. (2007) “Leader´s Frame-work for Decision Making”. Harvard Business Review, November 2007. Stacey, R (2001) Complex Responsive Processes in Organizations. Routledge. London. Stacey, R. D. & Griffin, D. & Shaw, P. (2000) Complexity Management. Fad or Radical Challenge to Systems Thinking? Routledge. London & New York.